June saw continued work on the new paving around the market House, giving the area a much nicer feel, and making it far more suitable for holding markets and events or just resting on one of the new seats. Elsewhere the one time Somerfield supermarket is being completely revamped in preparation for opening as an Iceland store. This should help to bring more shoppers to this end of the street. Also revamped is the swimming pool car park, which is now to the same standard as the one next to the new Sainsbury's supermarket. The new Iceland store takes shape with the shop front already altered to the new design. The new paving has considerably improved the area around the Market House, making it much easier to hold markets and events. Another view of the new paving near the vehicular exit on to Castle Street. Since the Sainsbury's supermarket car park was finished, the one near the swimming pool was looking worse for wear so this month it was resurfaced to bring it in line. A close up view of the statue of Queen Anne on the Market House building. This statue was made for a grand cost of £22 0s 0d. Viewed from the Town Hall, this picture shows the memorial gates to St. James' Church, unveiled in 1922. 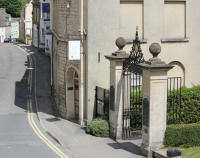 Beyond the gates is Long Street which continues downhill to the Priory building.